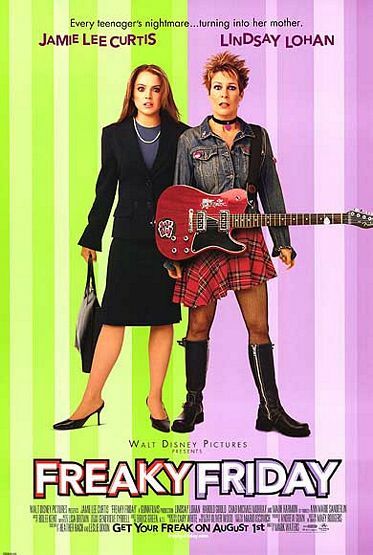 Freaky Friday, in case you missed the 1970’s version or the book, is about a mother and daughter who can’t see eye to eye and so get their consciousness transfered to each other’s bodies—they are made to literally walk in the others shoes for a few days. Lindsay Lohan plays a somewhat angsty teen who has a garage band. Jamie Lee Curtis plays her psychologist single mother. Lindsay Lohan isn’t too bad at playing the mother trapped in the daughters body, but Jamie Lee Curtis is horrible. At no point at all did I buy her performance. The plot is tired by now (it’s been aped a million times on TV) and there’s nothing surprising about anything that happens. All we get is vague moral platitudes about looking at things from the another person’s point of view. A sad waste of a movie.